Indeed. Leeds only getting 78% of their passes on target, Derby only getting 57% of theirs! Leeds have got a very good young player in Jack Clarke. Yeah he looks very promising. Good dribbler despite his height and gangly frame. Sit down, shock is better taken with bent knees. Leeds are just better. This is only my 2nd time watching them, if they come up I don't see how they would ever score. Granted the same was said about Cardiff this year and they seemingly will stay up. We'll see. David Nugent is only the first 33 years old. He's been around for ages. "I told them if we score it will be different. We scored. It was different." Leeds have been excellent this season. It's easy when you can send a spy to the opposition training ground. It wasn't even close to offside earlier in the move. Linesman got it completely wrong. Leeds under Bielsa would be great to have back in the PL. If Derby make the play-offs then Lampard will have had an excellent first season in management - by most accounts he's completely changed the style of play and lowered the average age of the squad so he looks to have something about him. Leeds were just better than them in every area tonight. Leeds are close to getting Fraser Forster from Southampton btw. Apparently their young keeper has made too many mistakes and they are after some experience. Would be a good signing (for that level only). Messi in fact doesn't have a recognizable trait. Don't think that would make it any less of an achievement for a young manager to finish in the play-offs in his first season having changed so much at the club over a short space of time. That's if Derby do finish in the play-offs, there are five points between them and Bristol City in 11th so they could fall away in the second half. Bielsa holding a press conference at 5pm apparently. Would drive you round the bend but his car won't start. Surely not resigning as per some (admittedly dubious) reports? Aye seen a few leople saying he's leaving but nothing on amything official. Bielsa makes Klopp look like Claude Puel. The bloke's a loon. Admitted he's spied on everyone this season. He's giving a PowerPoint presentation. What an absolute fuss over nothing, christ. Was hoping we would see Bielsa blub (has a devil put aside for meeeee). Peak Bielsa. Love it personally. Give that man a knighthood. He is using a powerpoint presentation to show all their analysis on Derby- i.e. hitting back at Lampard by helping all other clubs in the Championship. Is it really a surprise to anyone that clubs who spend loads of money on analysts do not ring as much as possible out of them by getting every piece of information available? Don't get what the big deal is. Everton have probably been spying on their opponents regularly for years and still been shite. 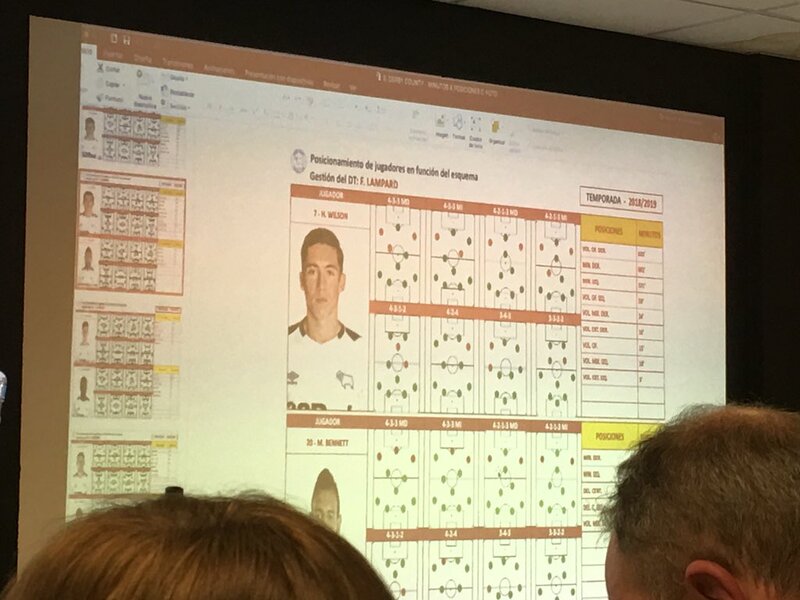 Frank Lampard must be delighted: he made a big fuss about a guy in the bushes, and now Bielsa is revealing every single minute detail of Derby's tactics over the last two years via Powerpoint to the entire football world. Holy moly. That’s one of the best things I’ve seen in football. No wonder some of the finest coaches on earth look up to him. Sensational. "Bielsa now using a big screen to demonstrated his analysis. Says what he's showing us took more than 300 hours of work. He's running us through the information he gathers for individual games, using Derby as an example. Bielsa says his staff watched all 51 games Derby played last season. Each game took four hours to analyse. "Why did we do that? Because we think this is professional behaviour. It's to try and avoid being ignorant about the competition we're playing in." BIelsa asks a journalist to pick out a specific game - Chelsea 3 Derby 2 from last season. Showing us the starting line-ups, the data from the game, substitutions and changes to formation during the game etc. This is a spectacular takedown of Spygate. Now showing us percentages for the number of times Derby have used certain formations and which players have moved around in different positions. "This gives you priorities." Now we're seeing analysis of the formations Derby have played against, to try and establish which structure they struggle against. "All this information, I don't memorise it. But if I have a doubt, I can ask myself the question and have a look at this document." Bielsa showing a video to demostrate what Harry Wilson is planning to do when he raises both hands before taking a corner. It's a specific play which Derby employ. "You cannot analyse football if you do not know who each player is." The players also get a seven/eight minute video looking at defensive points. "The idea is to give the players a look at the opponent in 15 minutes." Bielsa (and this is the rub:) "I don't need to go to watch a training session of an opponent to know how the opponent plays." Great story. Bielsa says he showed Guardiola his analysis after Bilbao lost to Barcelona in the Copa Del Rey final. "Guardiola had a look at it and he told me 'you know more about Barcelona than me'. But it was useless information because they scored three goals." Stoke are next up for Leeds. But they've changed manager. So since Nathan Jones took charge (last week), Bielsa and his staff have analysed every game he had at Luton this season. Bielsa thanks us for our patience, tells us he's stupid for doing all this analysis, opens the door and walks out (of the room, not the club). We're done. It comes down to anxiety for Bielsa - he says he analyses all of this because he's anxious to make sure he's got all his basis covered. Think the highlight of my time doing this job was his mic-drop at the end. "Thank you." Gone." He did the same thing when he was in charge of our National Team (extensive video analysis, with hours and hours of matches condensed into 8-9 minutes videos for the players to watch), so it's definitely his modus operandi. Love him. And he remains humble as ever. 51 games [90 minutes] X 4 HOURS = I am not sure that's true. Wonderful stuff from Bielsa Lampard be wishing he didn't open his big gob now. Wir brauchen viele Jahre, bis wir verstehen, wie kostbar Augenblicke sein können.